These days malware is everywhere. It's even in our flying war machines. 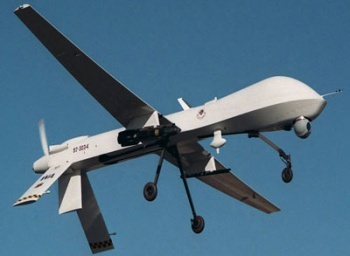 According to a recent report on Wired's Danger Room blog, the US military's airborne Predator and Reaper drones have been infected with a virus. Military techs say the virus intercepts and documents every keystroke sent to the drones by their ground-based pilots, though so far it seems that this information is not actually being transmitted to anyone. Unfortunately, the military seems unable to remove the virus. "We keep wiping it off, and it keeps coming back," an unnamed source told Wired. "We think it's benign. But we just don't know." A later Reuters report claims that despite the infection, the drones have continued in active service. Officially, the military remains coy on the issue. "We generally do not discuss specific vulnerabilities, threats, or responses to our computer networks, since that helps people looking to exploit or attack our systems to refine their approach," said Air Combat Command spokesman Lt. Col. Tadd Sholtis. "We invest a lot in protecting and monitoring our systems to counter threats and ensure security, which includes a comprehensive response to viruses, worms, and other malware we discover." Obviously this is bad news for the drone program, and the military's refusal to discuss the subject should come as no surprise, both given its standard operating procedure on matters of this nature and the inherent value the program has to both the military and the CIA. Over the past few years, a number of targets have been eliminated via drone strikes, most recently Muslim cleric and alleged Al Qaeda member Anwar al-Awlaki. Even assuming this keylogger is as benign as the military hopes -- and that's still somewhat suspect -- it does little to instill faith in the technology the government is using to fight our wars. Then again, it would be silly to think that any computer-based element of such a high-profile effort would be impervious to malware. If the past few decades have proven anything, it's that talented hackers and virus writers can and will circumvent even the most well-crafted security measures. That said, the only real question is when we'll see these drones struck by a truly malicious threat. Forget mass sentience, the real sci-fi horror story comes from the idea of a bored scriptkid taking control of a flying machine armed with heat-seeking missiles and a radar signature that borders on invisibility.